A mobile screen is much smaller than a desktop, so you need to ensure that your ads are still legible and carry the same impact. Desktop ads have more screen space that allows them to contain text-heavy copy and detailed images. Since mobile ads don't have this advantage, your creative needs to be bold, simple and eye-catching. 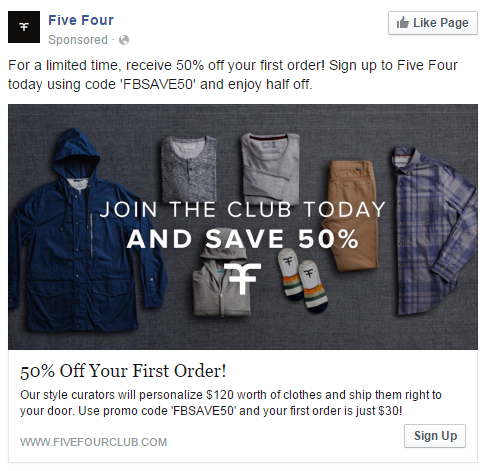 Below are two ads from the clothing brand Five Four. The first is the desktop ad. It has a little more copy and the image contains more pieces. The mobile ad contains simple, bold images and one line of text with a short phrase under each picture. 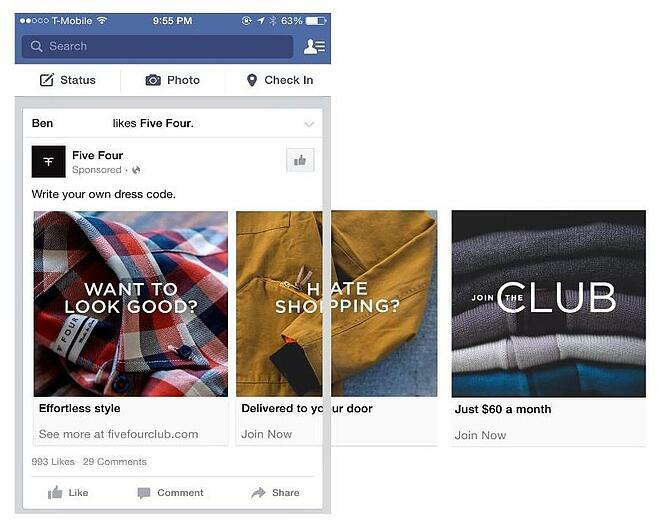 When creating mobile ads, campaigns need to be easy to understand and compelling to users. Simple copy and bold images are the best way to increase engagement on mobile. 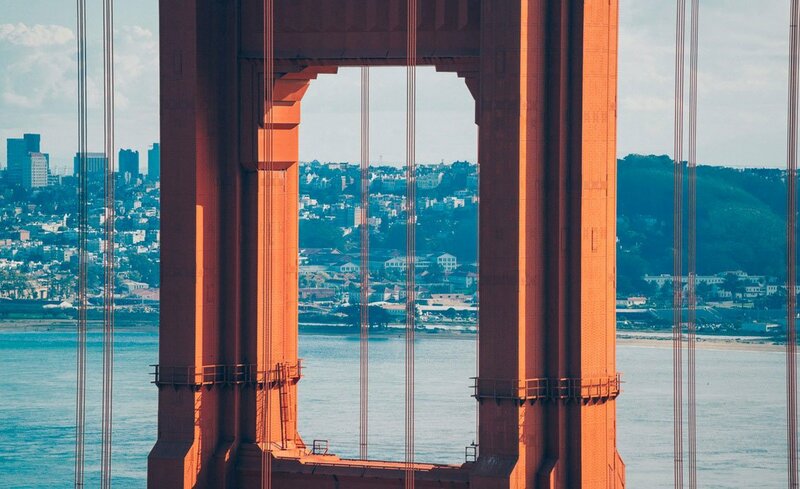 Your job isn't done after optimizing your images for mobile. Now you need to make sure that the page a user is taken to after clicking the ad can be easily navigated on a mobile device. If the page is designed for a desktop it won't have an intuitive layout and users will likely get frustrated trying to view it on a phone or tablet. 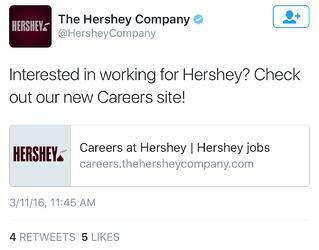 Hershey tweeted a link to their careers page for those interested in applying. 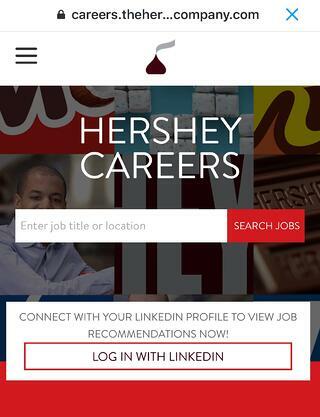 The page you are sent to is mobile-friendly and specifically about careers at Hershey so you don't have to go searching for it. 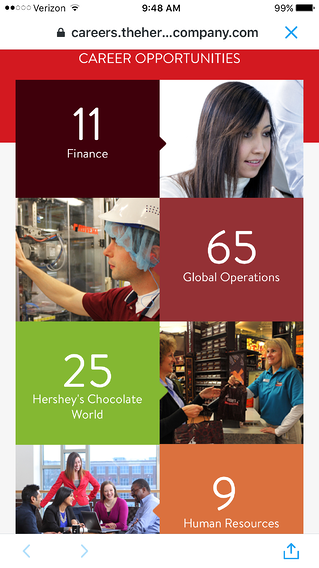 The landing page is colorful and divided into different job areas. You also have the option to log in with Linkedin for increased ease. These elements make it easy for the user to get to their destination which increases the chances of them applying for a job. To increase the chances of a user completing the desired action, make sure the page they are sent to is relevant to the ad and easy to view and navigate on a mobile device. The amount spent on mobile video ads in the U.S. increased over 80% in 2015 and growth is expected to stay in the double digits for the next few years (eMarketer). Video ads have allowed brands to increase brand awareness and engagement, while also enjoying higher click-through rates. There are many ways you can include video in your Facebook, Instagram and Twitter advertising campaigns. If you have a video on your website that introduces your product or service, you can turn it into a mobile video ad! 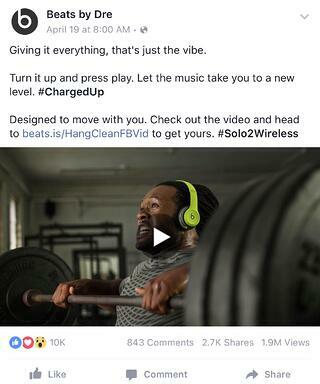 Beats by Dre has used videos of people wearing the headphones while working out, as an example. If you don't have videos, don't fear. You can use photos of your product or service to make a slideshow video. 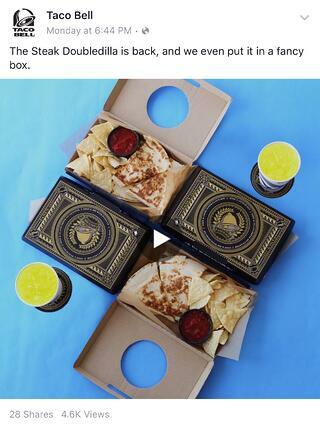 Taco Bell is familiar with using this technique; they've used it to showcase their Morning Value Menu, mobile app, and the return of the Steak Doubledilla. 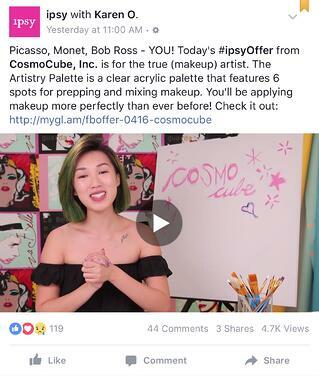 Ipsy has monthly offers that include discounts on various makeup brands. They make instructional videos for how to use the monthly offers correctly. Videos like these cost little and could even be made from a smartphone. Are you running social ads? Have you worked with mobile ads before? What do you find successful? We'd love to hear from you! P.S. If you want to find discover your competitors Facebook ads, check out this post.